As part of Research PhD, University of Aberdeen. ‘Xenopus’ functions as a multi-layered representation, illustrating the preparation of frog egg extract within the study of DNA replication and chromatin associated proteins. In ‘Xenopus’ the model takes on a different style of representation: Representation-as artwork. Where a model seeks to represent the primary elements involved, in illustrating the research as artwork I have opted to change the represented elements. The focus is instead on representing the research based on processes, reactions, the multiple levels and interconnected dimensions. The work is informed by research undertaken at the lab of Prof. J. Julian Blow, the School of Life Sciences, University of Dundee. 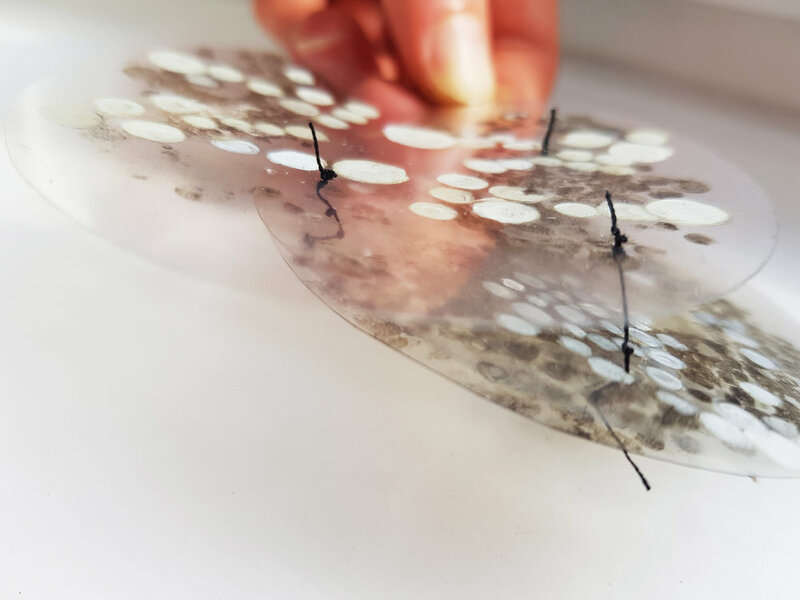 The image above (right) comes from the Research Lab of Prof. J. Julian Blow, from the paper "Preparation and use of Xenopus egg extracts to study DNA replication and chromatin associated proteins"
Material: Acetate, print, paint, hand stitch, seamstress pins.